This ILT Series course will teach students fundamental concepts and terminology, and the basic features of Adobe Acrobat X Pro. 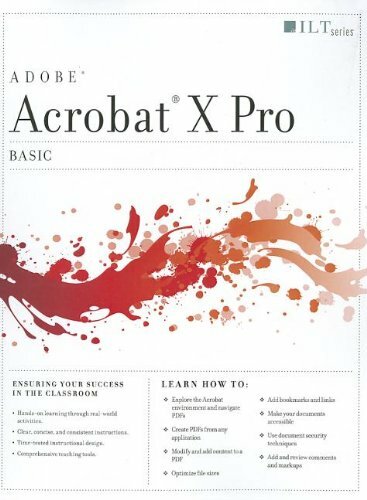 Students will learn PDF basics and explore the Acrobat interface. They'll learn how to navigate and organize PDF documents. Students will learn how to create a PDF document from within Acrobat. They will also create PDF documents from within other applications, and create documents from Web pages. Students will learn to modify PDF content by rearranging, editing, and formatting existing text; and by adding headers, footers, watermarks, and backgrounds. They'll learn how to insert multimedia content, including audio, video, and flash files. They'll add bookmarks and links, and improve accessibility in a document. Students will learn to manage security issues by using password encryption and digital signatures. They'll explore document review techniques, including the use of comments, markups, and automated reviews, such as Page View Sharing and Collaborate Live.